Good sport and trad climbing between the Sandanista Cliff and Van Dieman's Land on the back side of Taipan Wall. 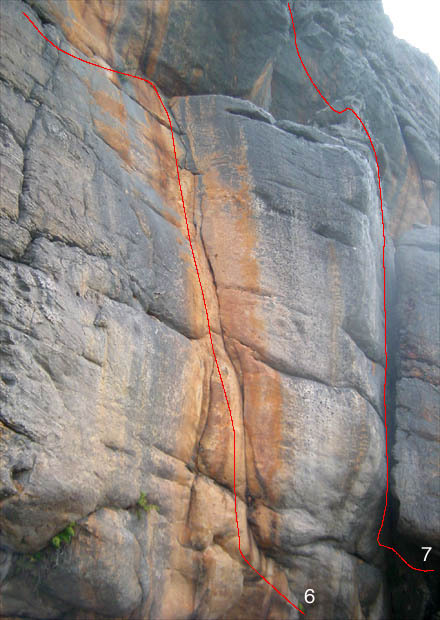 To get to the upper cliff with the excellent sport climbs you will need to climb a route on the left side of the lower cliff. The easiest and quickest is to solo (with care!) 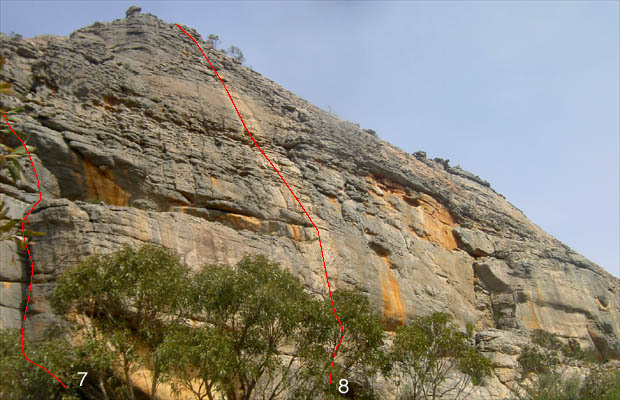 Access Line (route number 4) which has a tricky start but then relents to very easy jugs. 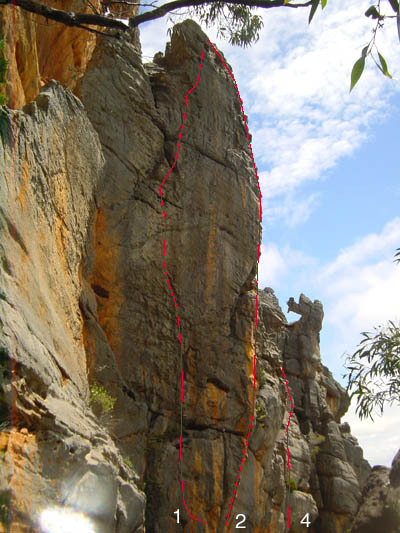 Another way up is the good grade 21 sport route, Raindancer (route 1). You will have to rap off the ledge to get back to the ground using the rings above Route 1. Double rings for lower off are located above Raindancer (1) for the lower cliff and above Twisted Horizons (10) for the upper cliff. 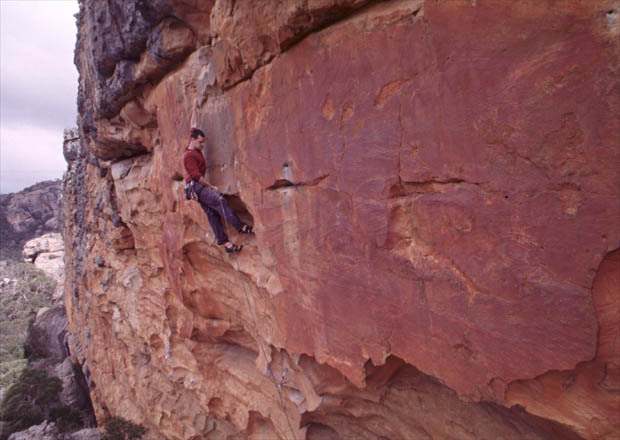 Above Right: Nick McKinnon on the FFA of The Big Payback 17m 25 on the Upper Cliff. All photos on this page by Neil Monteith. 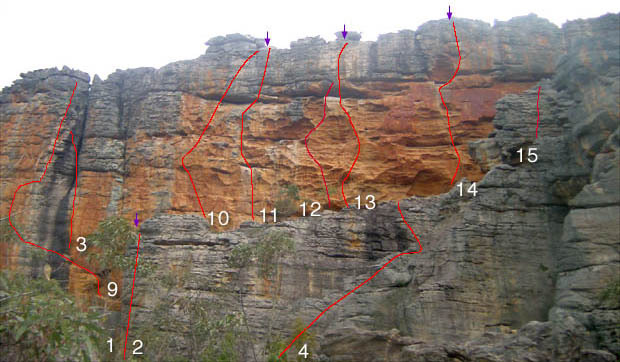 Below Left: Topo shots of the Lower Cliff, routes 1, 2 & 4. Middle: Routes 6 & 7. Right: Routes 7 & 8. Below Left: Topo of the upper cliff. Start 7m right of Twisted Horizons. 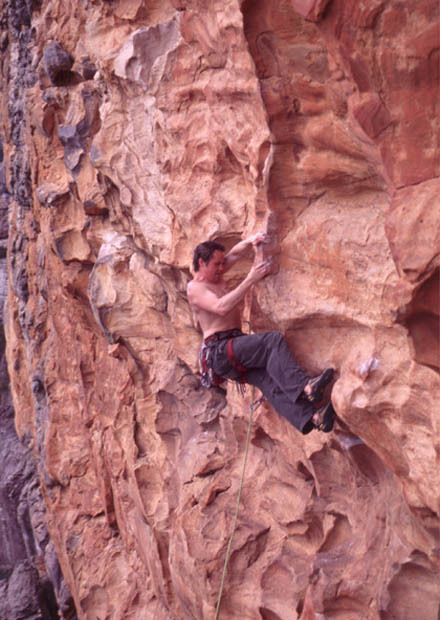 Climb past four ringbolts up balancy overhung flake to conclusion up juggy roof and headwall past another two ringbolts. Lower off twin rings. FFA Neil Monteith 7.10.2001. Right: Neil on the FFA. Cut Lunch Walls - Neil Monteiths web site, for more pics and latest updates. All text, images and video on this site are copyright. Unauthorised use is strictly prohibited.